Powers/Abilities: The Contemplator is immune to aging and conventional disease, and can allegedly regenerate from injury, as well. Superhumanly intelligent, he has complete mastery over his physical form and a high degree of sensitivity and understanding of the fundamental forces of the universe itself. He can control his body's involuntary responses (heartbeat, respiration, nerve ending responses, perspiration) as well as all of his body's natural functions and needs. He can perform great feats of physical coordination and agility simply by trying. His strength level is uncertain, but presumably he can channel some of his mental energies into feats of strength. As a pacifist, he seldom has any need for physical strength or battle skills, yet if he so desired he could channel his energies into such physical acts with surprising effectiveness. In his meditations he has unlocked vast mental powers latent in his mind. He psychic powers include telepathy, telekinesis, precognition, astral projection, teleportation, and telepathy, though he favors less rudimentary mental disciplines. He can convert himself into energy, traveling the universe at warp speeds and penetrating even advanced force fields. He can transport himself extradimensionally, completely or partially (as an intangible and partially invisible wraith). Through meditation, the Contemplator can expand his field of awareness to near-infinite parameters (achieving "cosmic consciousness" or "becoming one with the universe"), at which point he can probe the many phenomena that comprise reality and learn whatever he wishes. He occasionally uses his Energy Pyramid to aid him in astral projection, though he is more than capable of astral projection without assistance. (Official Handbook of the Marvel Universe Deluxe Edition#3: Contemplator) - The Contemplator's origins are lost in antiquity. He is one of the oldest living beings in the universe, having been a member of one of the first of the universe's races to become sentient in the wake of the Big Bang. (Quasar#37 (fb) - BTS) - The Contemplator has long forgotten his birthplace. (Official Handbook of the Marvel Universe Deluxe Edition#3: Contemplator) - Virtually immortal, the Contemplator has spent his life in meditation, developing the powers of his mind and spirit, and using them to plumb the mysteries of the universe. He eventually came to be as in tune with the forces of the cosmos as a physical being could be, and to believe that his every action is dictated by the desires of the cosmos itself. He chose to occasionally intervene in the lives of lesser but worthy beings to show them the path to greater enlightenment. He spent most of his time, however, in meditation, contemplating the infinite wonders of the universe with which he is intimate. (Marvel Treasury Special: Captain America's Bicentennial Battles) - The Contemplator, calling himself Mister Buda, summoned Captain America to his domicile to teach him a lesson about America. He first sent Cap back in time to World War II where he was reunited with Bucky and fought Hitler, the Red Skull, and the Nazis before returning. Buda then placed a psychic-talisman that sent Cap on a number of jumps through time, from Colonial America and a meeting with Ben Franklin and Betsy Ross where his costume apparently inspired the American flag; to the Great Depression, where he fought gangsters harassing a newsboy; to the 18th century where he got caught in a struggle between the forces of Geronimo and some white settlers; to a collapsed coal mine where he helped the victims escape to the surface; to a World War I plane fight; before briefly returning to Buda again, who noted the value of viewing the bad times with the good; and then back to the 19th century where he outfought the legendary boxer John. L. Sullivan; then to where he helped a runaway slave escape those who sought to return him to his former owners; then to Almagordo where he witnessed the first nuclear bomb test; then to 1871 on the night Chicago burned down; then to a modern era undersea research base; then back to Buda; then to the future for a battle on the moon; then to a Hollywood musical celebrating America's history; then back to Buda; before taking a final trip to the modern era where he enjoyed spending time with the future hopefuls of America's youth. (Captain America Annual#6 (fb) - BTS) - Following some perceived cosmic destiny, the Contemplator met with the aged Jeff Mace, the former Patriot and Captain America who was now dying from cancer, and agreed to help him relive his glory days. (Captain America Annual#6) - Revealing himself to be an Elder of the Universe, the Contemplator plucked from time Captain America (Steve Rogers) and Jeff Mace from the modern era; Captain America (William Nasland), who had succeeded Rogers after his seeming death in 1945 and preceded Mace as Captain America in the All-Winners Squad; and Captain America ("Steve Rogers"), the Captain America of the 1950s. Mace further explained that by plucking them all from time, the Contemplator had diverged reality-8206, wherein the android Adam II (who had been thwarted by the All-Winners Squad on Earth-616) had conquered the world and begun turning people into cyborgs under his control. Evading each of Rogers' attacks, the Contemplator ultimately convinced him to join the other three Captain Americas in traveling to Earth-8206 to liberate it from Adam II. Each of the Captain Americas fell before Adam II's forces, but when Mace fought Adam II, the Contemplator allowed him to tap into the essence of Rogers. Mace began to defeat Adam II and was given the chance of keeping Rogers' essence and usurping his identity, but he realized he could not sacrifice Rogers to do so. Mace's strength faded and he fell before Adam II, but all of the Captain Americas then teamed up on Adam II and overpowered him. Mace's shield delivered the final blow that destroyed Adam II. The Contemplator then summoned them back to his abode, and the past Captain Americas were returned to their own times. The Contemplator then confirmed that Mace was now at peace with himself, and reaffirmed his own mission: seeing the perfection in the cosmic plan -- and the majesty that lies unstained in every heart. Mace and Rogers were returned to their own world. (Quasar#37 (fb) - BTS) - The Contemplator learned of a being impersonating him and sought to confront that being. 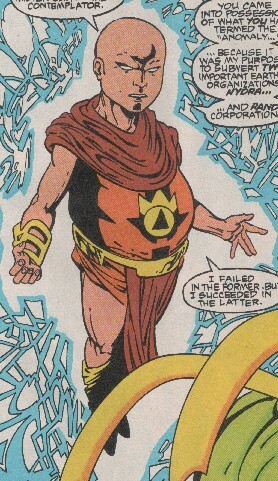 (Quasar#37) - The Contemplator sensed the presence of the infant Origin (at then point unidentified), who had been wounded by the powerful Soul-Eater. The Contemplator traveled in energy form to the space around Origin, effortlessly passing through Quasar's quantum shield. He introduced himself to Quasar, Makkari, and Her (soon to be Kismet) and recognized them as from Earth. He wished to contemplate on the nascent cosmic-class entity and, upon observing its wounds, meditated to summon an Elder, the Caregiver, who healed and established a bond with the fetus. Quasar thanked the Contemplator, who notified him of the Contemplator imposter and asked him to detain him if he ever encountered him. Captain America then contacted Quasar and asked him to look into the cosmic entity Eternity (who had been incapacitated by the Magus during the "Infinity War"). 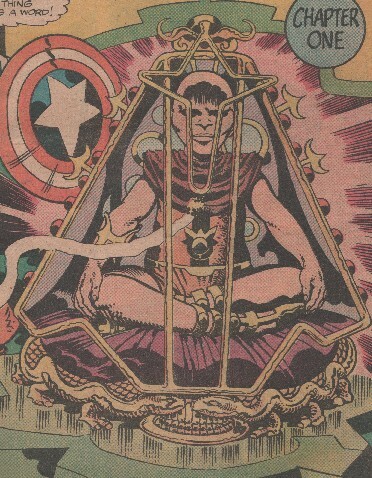 The Contemplator offered to combine his abilities with Quasar's power to access a plane of existence of the abstract beings, which they did, arriving in the Dimension of Manifestations. After wandering for a time, they encountered Anthropomorpho, the Prime Manifester, who explained the nature of the realm to them. Quasar and the Contemplator searched various sub-realms for the appropriate manifestation of Eternity, with Quasar twice being assaulted by the Anomaly (embodiment of all things that are like no other things), against whom the Contemplator encouraged Quasar to surrender, which allowed him to achieve victory. They located the appropriate Eternity, who was comatose and whom the Contemplator determined was in the grip of some unspeakable powerful outside force. Quasar then returned to Earth to join many of its other heroes in taking action to save the universe. (Iron Fist II#1 (fb) - BTS) - The Anomaly Gem -- which was kept in Lei Kung the Thunderer's K'un-Lun sanctum and contained the spirits of all those who had ever held the power of the Iron Fist, including the Steel Serpent (Davos) -- was shattered during a H'ylthri invasion. Two of its fragments were lost. (Iron Fist II#1 (fb) - BTS) - The Contemplator made an arrangement with the Steel Serpent to facilitate the reassembly of the Gem under such conditions that he would be reincarnated and his spirit would be released from the Gem. (Marvel Comics Present#132/4 (fb) - BTS) - The Contemplator, allegedly hoping to subvert the organizations Rand-Meachum and Hydra (ultimately hoping to redeem them both), guided those two organizations to the two Anomaly Gem fragments. (Marvel Comics Present#125/4-130/4 - BTS) - Iron Fist (Daniel Rand) investigated the Anomaly Gem and fought off efforts to steal it by agents of Hydra and AIM. Ultimately he found that Hydra had another fragment of the Anomaly Gem. (Marvel Comics Present#131/4) - Strucker placed the two fragments of the Anomaly Gem side-by-side, and their energies began to open a portal to the realm of the Contemplator. (Marvel Comics Present#132/4) - The portal opened completely, and the Contemplator emerged and explained his purpose: while Hydra had proven beyond his power to redeem, he had sought to bring peace and contentment to Iron Fist by breaking him away from Rand-Meachum, whose corruption had shaken his faith. The Contemplator then announced that Iron Fist must begin his quest to become the superior man; and to help others attain a goal that is unreachable: the goal of universal perfection. As he faded back to his realm, the Contemplator fused the two Anomaly fragments together and told Iron Fist that he could use it to summon him as needed to act as his oracle or spiritual compass. (Spider-Man Unlimited I#13) - The Contemplator (in especially bloated form) communed with Danny Rand at his office in the Rand-Meachum Building, but he swiftly departed when Power Man (Luke Cage) arrived. Danny complained of having been unwell lately, and that a demon had been hanging over him, a spectre of failure and despair. (Iron Fist II#1) - The Contemplator guided Iron Fist towards his destiny in regaining the full power of the Iron Fist itself, which had been markedly weakened since his near death at the hands of the H'ylthri. He told Iron Fist that he needed the last piece of the Anomaly Gem, which he wound find by the K'un-Lun mountain. (Iron Fist II#1 (fb) - BTS) - Lei Kung the Thunderer dispatched Brother Kon-Shi and his men to Earth to locate the Anomaly Gem fragments. (Iron Fist II#1) - The Contemplator guided Iron Fist to Kon-Shi's wagon, telling him that they were bandits who had stolen the fragment. Iron Fist then took the Gem fragment from them and joined it with the others, which then reincarnated the Steel Serpent who then siphoned Iron Fist's power. Steel Serpent returned to K'un-Lun and positioned himself to become their leader, and Iron Fist followed him. (Iron Fist II#2) - Iron Fist defeated the Steel Serpent in single combat and reclaimed and fully accepted his power, finally re-achieving peace with himself. (Annihilation: Ronan#3) - The Contemplator was one of a number of beings (including several other Elders, such as the Astronomer, Champion/Fallen One, Grandmaster, Judicator, and Runner) who traveled to the planet Godthab Omega, presumably drawn there by Glorian. The newly arrived group witnessed the arrival of the Annihilation Wave/Swarm. Comments: Created by Jack Kirby, with Herb Trimpe, John Romita, and Barry Windsor-Smith. The Contemplator was lean and fit in his early appearances. 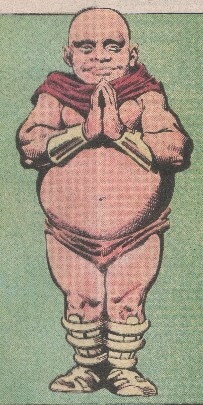 I think the name Mister Buda inspired people to draw him more like Buddha, who is usually pictured with a large potbelly...especially in the OHotMU Deluxe Edition entry. The Master Edition states that he has spent 4.5 million years in his studies. 4.5 million is not a long time relative to the age of the universe, 10-15 billion years. If he were one of the oldest beings in existence, I'd think he would have been around much longer. Or not. The Master Edition notes how radically different his appearances were in the Silver Surfer story, indicating that there may be more than one Contemplator, which later proved to be true in Gru's own story in Quasar. Some of the data in the Master Edition refers to the imposter. Contemplator received entries in OHotMU I#3, Deluxe Edition#3, Master Edition and All-New OHotMU Update#2.